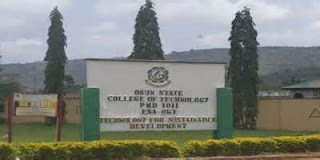 Osun State College of Technology (OSCOTECH), Esa-Oke Basic and Foundation Studies Programmes Admission Forms, Courses, Admission Requirements and Application Guidelines for 2018/2019 Academic Session. Applications are invited from suitably qualified applicants for admission into the under-listed One-year basic and foundational studies which would be available in the institution during the 2018/2019 academic session. subjects in GCE ‘O’Level or SSCE of WAEC or SSCE of NECO or NTC of NABTEB. Accounts, Statistics, Government, History, Biology and Agricultural Science. subjects in GCE ‘O’Level or SSCE of WAEC or SSCE of NECO or NTC of NABTEB. All applicants must possess at least passes in English Language and Mathematics in the specified examination. Applicants must possess at least four passes in English Language, Mathematics, Physics and any one (1) of the following: Chemistry, Technical Drawing, Building Construction, Woodwork, Geography and Economics. Applicants must possess at least four (4) passes in English Language, Mathematics, Physics and any one (1) of the following: Chemistry, Technical Drawing, Building Technology, Woodwork, Economics and Geography. Applicants must possess at least four (4) passes in English Language, Mathematics, Physics and any one (1) of the following: Chemistry, Technical Drawing, Building Construction, Fine Arts, Woodwork, Economics and Geography. Applicants must possess at least passes in English Language, Mathematics, Economics or Geography, and any one (1) of the following Basic Science subject: Physics, Chemistry, Biology, and Agricultural Science. Applicants must possess at least four (4) passes in English Language, Mathematics, Physics and any one (1) of the following: Chemistry, Technical Drawing, Geography, Further Mathematics, Economics, Commerce, Statistics and Building Construction. Applicants must possess at least passes in English Language, Mathematics, Economics and at least any one from the following Basic Science subjects: Physics, Chemistry, Biology, and Agricultural Science. In addition to general entry requirements, applicants must possess passes in Chemistry and Physics in all the three (3) courses listed above. Applicants must possess at least minimum of four (4) passes in requisite subjects as stated below at not more than two sittings in GCE ‘O’ Level or SSCE of WAEC or NECO or NTC of NABTEB. All applicants must possess passes in English Language and Mathematics in the specified examination. In addition to general entry requirements, applicants must possess pass in Physics and any one (1) of the following: Chemistry, Economics, Biology, Agricultural Science and Geography. In addition to general entry requirements, applicants must possess two (2) passes in Science or Social Science subjects. In addition to general entry requirements, each applicant must possess a pass in Physics and any one (1) of the following subjects: Chemistry, Agricultural Science/Biology/Health Science. Applicants are to purchase admission scratch cards from any of the under listed banks at a cost of N7,500.00 (Seven Thousand, Five Hundred Naira Only). 4. First Bank Nig. Plc. U.I. Branch, Ibadan, Oyo State. Applicants are free to check the provisional lists of successful applicants online with the purchase of scratch cards at a cost of N1,000.00 (One Thousand Naira Only) from any of the above listed banks.